The Syrian Democratic Forces (SDF), which is dominated by the Syrian PKK affiliate Democratic Union Party's (PYD) and People's Protection Units (YPG) militia, crossed the Euphrates in Syria on Thursday, something that Ankara has said is a redline as a national security threat. As part of an extensive operation carried out by the U.S.-led anti-DAESH coalition forces that have been in Aleppo province's town of Manbij, militants and armored vehicles from the SDF crossed west of the river on ferries to join the ground operation that is supported by the U.S. airpower. Speaking at a press conference in Kenya Thursday, President Recep Tayyip Erdoğan said the U.S. assured Turkey that mostly Arab forces will conduct the operation in Manbij instead of the YPG. "The main forces are Arab militants. That is what we were told," he said. Ankara has reiterated that the YPG crossing west of the Euphrates is a red line, calling it the PYD expansionist policies under the guise of fighting DAESH. The YPG aims to advance from two directions in the area located between Azaz and Jarablous in northern Syria, where Ankara has planned to establish a safe zone. Erdoğan had said in a live televised interview that Turkey will take the necessary steps to prevent PYD terror in northern Syria. "Turkey does not need to obtain permission from anyone to interfere in the region to secure its borders," he asserted. The YPG proceeded to the Tishrin Dam on the Euphrates, again with aid from U.S. airstrikes, creating a stepping stone for their advance on the western bank of the river on Dec. 27. After the YPG took control of the Tishrin Dam, the nearby town of Manbij, which is currently under DAESH control, has become a possible destination for the group's expansion. 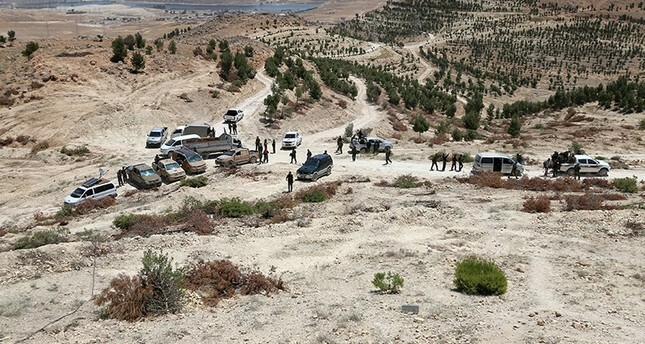 Citing the PYD's ties with the outlawed PKK, Turkish officials have repeatedly said a PYD presence in this area would be a direct threat to the country's national security, and they do not want its ties over land with the rest of Syria and the Middle East cut off by a hostile force. Various nongovernmental organizations also warned that the PYD had carried out war crimes and forced relocations of Arab and Turkmen populations in the area to maintain its presence. Instead of PYD or regime control in the region, Turkish officials have long proposed establishing a safe zone in the area.